The 2017 Kendon Smith Lecture Series (KSL) is Nearly Here! 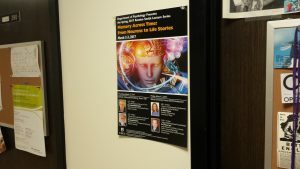 The Eberhart Building, like most buildings on campus, gets carpeted with flyers and posters and leaflets and ads of all stripes. You need a really sweet flyer to stand out on the bulletin board. That flamboyant poster can mean only one thing: the 2017 Kendon Smith Lecture Series is nearly here! If any poster will stand out from the mass of “Apartment for Rent!” flyers, this one will. All the illuminated clocks flying from the person’s head is a little eerie—just like cognitive psychology itself, I suppose. Anyhow, this series—known as KSL for short—is one of our department’s premiere intellectual events. It is one of the coolest things we do, and I look forward to it all year. 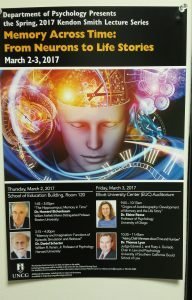 For KSL, one of the professors picks a theme and organizes a handful of eminent scientists to come to campus and talk about their research. This year, the theme is “Memory Across Time: From Neurons to Life Stories.” An excellent group of scholars is traveling to campus—some from as far as New Zealand—for the event. The series is named after Professor Kendon Smith, who taught in the UNCG Psychology Department for many, many years. By all accounts, he was a gracious person, committed teacher, and influential mentor. The lecture series, in fact, is endowed by a generous gift from Janice Stewart Baucom, a former student, and we’re grateful for her gift that allows us to put on such a major event annually. It’s fitting that the series is named after Kendon Smith, not only because he is so warmly remembered, but because he was an unusually erudite person. He passed away before I had to chance to meet him, but everyone who knew him remarked about his intellect. In psychology, our ideas live on in our writing, so we can get a sense of Kendon Smith’s thinking from what he wrote. Many years back I bought a copy of his major book, Behavior and Conscious Experience. 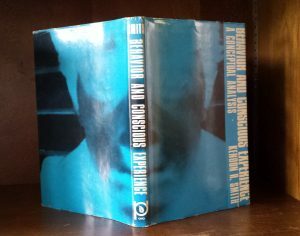 They say you can’t judge a book by its cover, but psychologists know that people are sort of superficial creatures, so have a look! 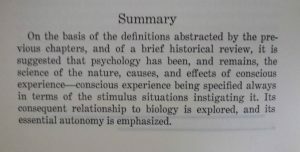 Behavior and Conscious Experience was published in 1969, a time of incredible ferment in psychology. 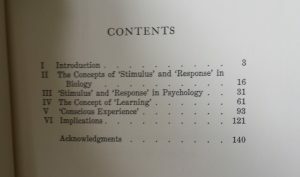 The leading school of thought, behaviorism, was butting heads with an emerging school of thought, cognitive psychology. Psychologists were getting interested in topics—like mental imagery, emotions, and consciousness—that the old-school behaviorists saw as taboo and unscientific. Kendon Smith’s book was an attempt at an intellectual rapprochement between these warring schools of thought. Here’s the Table of Contents, if you’re curious. Perhaps I’ll do a book review, 50 years too late, of it for a future post. I break out and flip through this book every year around this time. Although the 2017 KSL event will be all about the big ideas of 2017, it’s worth remembering that deep ideas age well. See you at the lectures!